I received an e-mail last week requesting help responding to claims attributed to a wind-industry friendly administration in Ontario claiming that we were, at times, importing electricity. I’ve pulled some figures in response and thought I’d take a couple of minutes to post my comments. Of course we often have some imports into Ontario – because it’s a market connected to other markets. 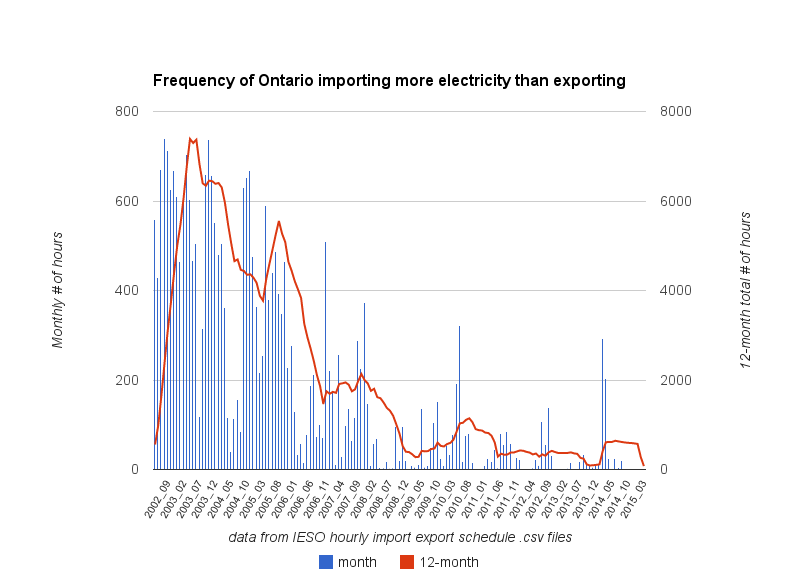 However, the number of hours Ontario imports more than it exports dropped from market opening (in May 2002) to the recession of 2009/09. Ontario’s IESO has released reams of reporting today. My initial take is it communicates an organization is decline. The least credible claim I’ve picked up on so far is in the new Conservation Progress Report for the 4th quarter of 2014. This was first posted on my coldaircurrents site – which I use for posting found items of interest. This post went beyond pointing out OPG’s 2014 results, with enough of an edge I’m double posting it here. I’ve flipped through OPG’s 2014 MANAGEMENT’S DISCUSSION AND ANALYSIS and spotted some things of interest to me, relevant to many things I’ve written. There’s news in OPG’s reporting that, I’ll just put out there, maybe I should get a nice cheque for. The Globe and Mail reported early March 10th that Premier Wynne’s Ontario government is looking carefully at selling off a portion of Hydro One. The government has not yet decided exactly how much of the company to sell off beyond the initial IPO proposal, or whether the private sector would ultimately own a majority of the company’s equity, sources said. Much of that would depend on how the initial sale goes. …The developing proposal is said to have the blessing of Ms. Wynne’s powerful lieutenants: Deputy Premier Deb Matthews, Finance Minister Charles Sousa, Energy Minister Bob Chiarelli and Infrastructure Minister Brad Duguid. The Premier said Tuesday that word of the IPO plan “has gotten into the public realm prematurely” and she has not made a “final decision” on whether to pursue it. I live a little north of the commonly perceived end of Mississauaga’s world (Barrie), but actually still within the orbit of the Toronto area. I’m not condoning the sentiment. Just after 7 the first phone call (south Etobicoke); with the request to see what’s happening with their power situation because not only is their power out, the data wasn’t working with the cell provider either. Hilarity ensues: nothing on Toronto Hydro outage map for the area, so I entered an outage form – which after entering saw the screen change to a screen telling me if I have a problem to fill out the form below – which did not exist. “Follow the trendlines, not the headlines”, Bill Clinton once said. He may not – no certainly – does not believe this too much. But as a piece of guidance it is rather wise. Here is what the headlines will tell you about renewable energy in Europe. There is a renewable energy revolution in Europe and this is being led by wind and solar. First, there is nothing meriting the term “revolution” going on in EU energy. A simple comparison makes this clear. I posted a serious (a.k.a. confusing) piece on Cold Air yesterday, Ontario is the sucker of first choice for off-price electricity and today I’ve run the routines on February data. The Toronto Star advises February was Toronto’s coldest month ever. I didn’t read beyond the title, but I don’t think they meant emotionally. 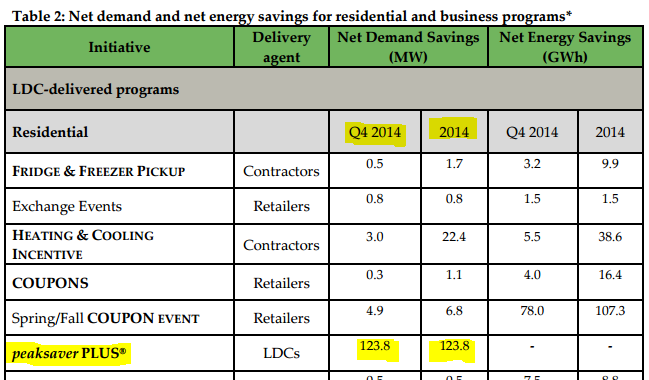 “Ontario Demand” as defined by the IESO, was up about 2% from last year’s also pretty cold February. 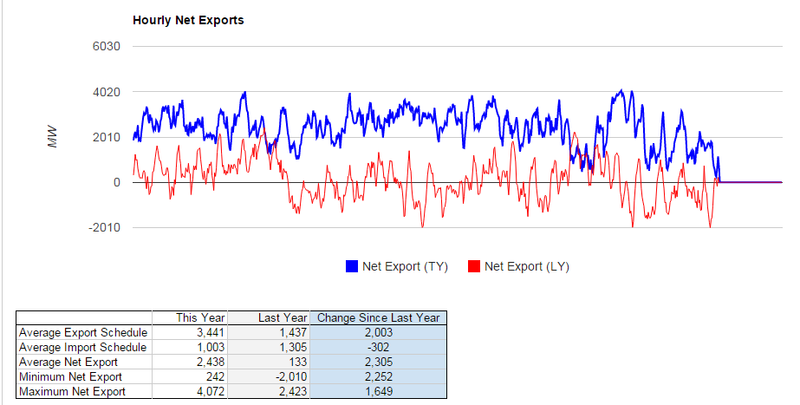 And yet, average hourly net exports were higher than ever – although the fewer days didn’t allow the total net exports to reach January’s high. On Friday the IESO release preliminary Global Adjustment [GA] figures: the first estimate of the dollar total is $474 million, and the second estimate of the class B rate is $40.95. These estimates may or may not be reliable, but the rate will be used to charge some class B ratepayers much less than the $69.81 1st estimate GA charged other ratepayers. Smart is a relative term. Whoever thought of bumping up the billing cyle during this era of virtually nil interest rates my be considered smart with all those revenues coming in a couple of weeks earlier. To me, with interest rates near zero it matters little if they are future receivables or cash in hand. Billing on unexplained estimates doesn’t seem smart, just irresponsible.